Tom “the Turkey Slayer” Mason calls out Martin Jacobson during the Bros vs Pros challenge after he took a huge pot off him in the last hand of the live stream. The Bros had plenty to say about Tiffany Michelle too as they get ready to jump into the Main Event. 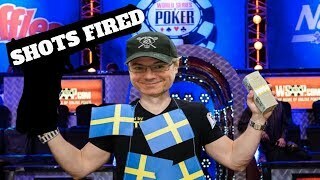 Tom Dwan di nuovo sotto accusa per uno scam milionario denunciato da Haralabos Voulgaris!